CREDIT: Insane Clown Posse - "Leck Mich Im Arsch"
And here’s the video teaser for the song from Third Man’s official YouTube channel. In the grand tradition of peanut butter meeting Iggy’s chest or Bing Crosby getting down with David Bowie, Third Man Records is ecstatic to present the latest in a long-line of unexpected musical pairings…Insane Clown Posse and Mozart. Back in ’82, ahem, 1782, Wolfgang Amadeus Mozart wrote a piece that’s been left out of the spotlight ever since. The title of the piece is “Leck Mich Im Arsch” or literally translated to English as “Lick me in the arse.” Understandably this piece has figuratively been swept under the rug. 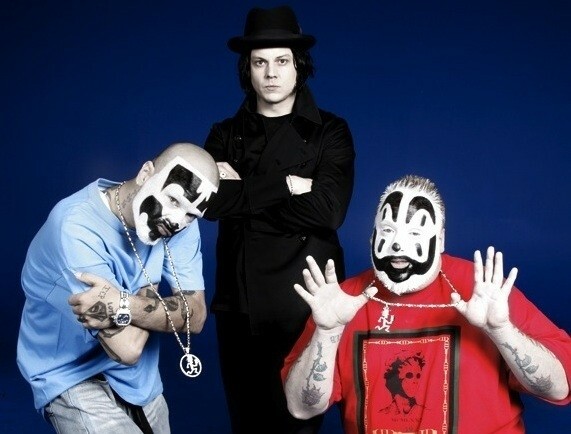 So who better to give this piece it’s due respect than the wildly successful, much misunderstood, and divisive Southwest Detroit rappers Insane Clown Posse? With fellow Southwest Detroit-born Jack White at the production helm and musical backing by Nashville’s very own Jeff the Brotherhood, this 2011 version of “Leck Mich Im Arsch” marries Mozart’s melody (and lyrics sung in operatic German) with ICP’s poignant lyrical addition in English and Jeff the B’s monster-riffs, letting the whole thing tie together in the most beautiful of ways. The b-side “Mountain Girl” finds Violent J and Shaggy 2 Dope telling tall tales about a shotgun wedding, meth problems and moonshine…all pretty common-fare for a twangy country song birthed in Nashville. The 7″ single and iTunes digital download of “Leck Mich Im Arsch” will be available for sale on September 13th. One-hundred Tri-color versions of the single will be available from the Third Man Rolling Record Store at the MI Fest in Brooklyn, Michigan on September 17th and another 50 Tri-colors will be randomly inserted into mail orders dispatched by Third Man Records. “Leck Mich Im Arsch” will be on sale 9/13 through Third Man Records.